Regular Burglar mice merely pick pockets... Master Burglar mice stage elaborate heists. Attracted only to Gilded Cheese and SUPER|brie+, Master Burglar mice eschew any aspect of life that isn’t gold or diamond-encrusted. Catching a Master Burglar Mouse in the Bazaar is well worth the effort. In the past, they have been known to drop precious items, and this time, rumor has it that the Master Burglar mice have run off with one of the King's crown jewels! The Master Burglar Mouse can only be attracted with SUPER|brie+ or Gilded Cheese. No Charms are required to attract the Master Burglar Mouse. The Master Burglar Mouse has a predominate weakness to Law weapons, but is found in locations were using a Law trap would be less effective against the other mice that Hunters will encounter. Hunters can encounter the Master Burglar Mouse in the Bazaar and Town of Gnawnia locations. The Crown Jewel is required for obtaining the King's Gauntlet Floorplan, which can be purchased in the Bazaar Cartographer. The King's Gauntlet Floorplan is required for Hunters to access the King's Gauntlet location. The Master Burglar Mouse will drop the Encyclopedia Gnawnia in the Town of Gnawnia when working the Zurreal Trap Research Assignment. The Encyclopedia Gnawnia is necessary for crafting the Zurreal's Folly weapon. Attraction info and special event loot drops for the Master Burglar Mouse can be found at the individual event location pages. 9 September 2008: The Master Burglar Mouse was initially a single mouse of his kind. He was released during the $2,500 Tuesday event. He had stolen the King of Gnawnia's crown and every Hunter was encouraged to do their utmost to capture it and recover the crown. On the following day, the mouse was caught by a lucky hunter, who won $1,000 (CAD) for her efforts. More ambitious than regular Burglar mice, the Master Burglar enjoys theft on a much grander scale. Most recently one such mouse was daring enough to steal the King of Gnawnia's crown! Devastated, the King urges his hunters to go forth and capture this mouse! According to the developers, the Master Burglar Mouse is named Bob. 8 June 2010: The Master Burglar Mouse was reintroduced as a breed with the release of MouseHunt version 3.0. 25 January 2011: The Master Burglar Mouse began to drop Flawless Orbs as loot. 23 August 2011: The Master Burglar Mouse began to drop the Encyclopedia Gnawnia as loot in the Town of Gnawnia. 25 June 2013: The Master Burglar Mouse gained a vulnerability to Law power type traps, with the release of Varmint Valley. 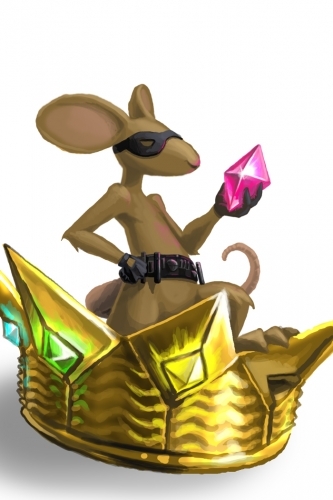 25 March 2014: The Master Burglar Mouse gained a vulnerability to Rift power type traps, with the introduction of the Rift Plane. 29 July 2015: The Master Burglar Mouse is no longer found in King's Arms, and no longer drops the Crown Jewel in the Town of Gnawnia.